His complete recordings for the Bihari brothers’ Kent label, together on one package for the first time, including many making their CD debut. 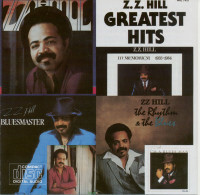 For two decades Z Z Hill was a go-to guy for anyone who needed a shot of blues-tinged soul music. His catalogue of recordings includes many masterpieces of southern soul, his Texas roots showing through wherever he recorded. After years of critical acclaim, and a late flourish of hits, he was about to take his career to a bigger stage in 1984 when complications from the aftermath of a car crash robbed black American music of one of its finest singers. 20 years earlier Z.Z. 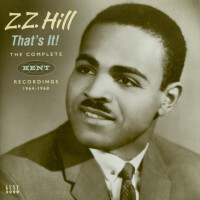 scored his first hit with ‘You Were Wrong’ on his brother’s MH label, which led directly to his signing to the Kent subsidiary of long-established Modern Records. For the next four years he recorded prolifically and enjoyed many strong local sellers that all refused to breach the national charts. Hits or no hits, Z.Z. 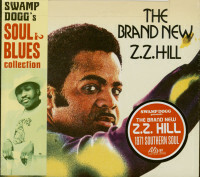 always got great songs and productions, and soul fans who have been enjoying them for many years will thrill to the quantity featured in this month’s 2CD set. 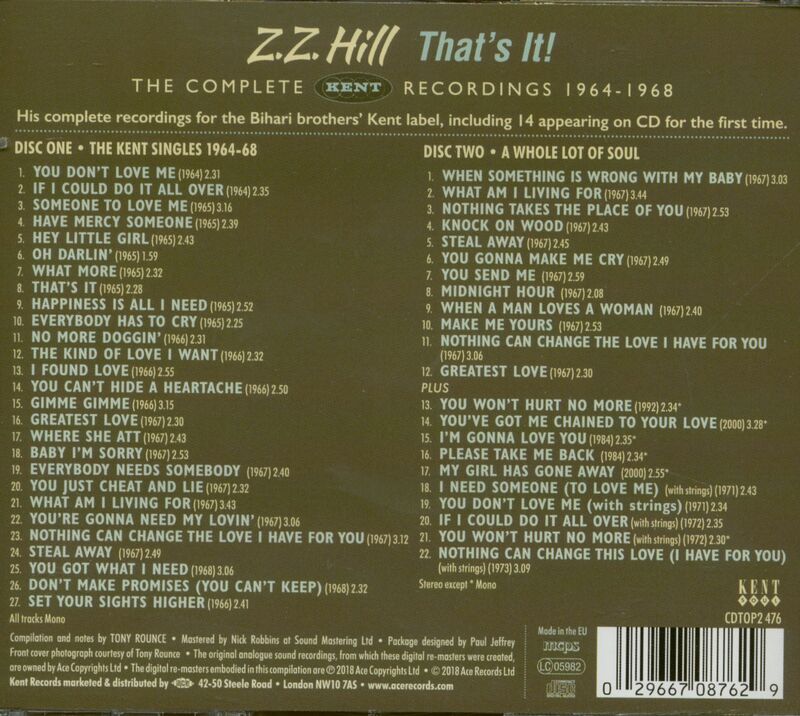 CD1 features all the singles Z.Z released during his time as a Kent artist, 1964 to 1968, in mono and with each tape carefully matched against an original 45 to ensure they are heard just the way they were meant to be heard. 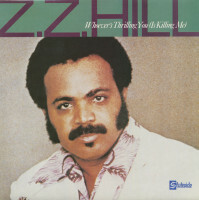 CD2 contains the first-ever CD release of his 1968 album “A Whole Lot Of Soul”, in stereo, plus originally unissued material and tracks onto which Kent-Modern’s Joe Bihari added strings after Z.Z. started to score hits for other labels in the early 70s. Few CDs we’ve ever put out live up to their titles quite as conclusively as “That’s It!”. The CD booklet features a sessionography which reveals hitherto unpublished information about recording locations, producers and engineers for these tracks. For any 60s soul fan, “That’s It!” is all that, and more besides. Born ARZELL HILL on 30 September 1935 in Naples, East Texas — about 40 miles from the point where the borders of Texas, Louisiana and Arkansas meet — he began singing in his teens. Like many of his contemporaries, he was initially drawn to gospel music. It's been written that he toured with gospel stars the Spiritual Five, from the nearby town of Tyler, but the outfit's personnel turnover was fast and frequent and he doesn't appear to have been with them long enough to make a record. By the late 50s he was listening to secular music, and in later years would cite Sam Cooke, Bobby Bland and Freddie King as the major influences on his style. Forgoing life as a gospel singer for a career as a blues man, he migrated northwest to Dallas where there was a thriving club scene of which he quickly became part, changing his name from Arzell to Z.Z. in honour of another of his heroes, B.B. King. His elder brother Matt moved to California at the end of the 1950s and invited Z.Z. to join him.There he worked the club circuit while Matt tried to hustle a record deal for him. In 1960 he recorded six songs which Matt managed to sell to Chess, although the company decided not to issue them. Frustrated by the lack of interest, Matt formed his own Mesa and M.H. labels in late 1963, with Z.Z. as his initial signing. His first release,'Five Will Get You Ten' on Mesa, sold well locally, while the second,'You Were Wrong' on M.H. (a song he had recorded as 'You Was Wrong' at his 1960 session), spent a week on the bottom rung on Billboard's Hot 100 in March 1964. Customer evaluation for "That's It! The Complete Kent Recordings 1964-1968 (2-CD)"